Turns out that getting back into the routine I had before my trip to Colorado has been a lot harder than usual. My biggest stumbling block came Monday night when I awoke with a 101-degree temperature. I ended up in Urgent Care this morning because my regular physician didn’t have any appointments open today. After two hours of processing, I was diagnosed with pneumonia and sent home with a packet of drugs. Hopefully, it’s a mild case because I seem to be getting a little better each day, with the possible exception of last night when I must have only managed about two hours of sleep between coughing bouts. So, it looks like it might be a little longer before I’m back to a regular schedule. I think that if I had gotten some absolutely great birding shots on my Colorado trip that I could have forced myself to post an entry or two during the week, but, as it turned out, birding in Colorado this time of year is nearly as slow as birding in the Pacific Northwest this time of year. I’m pretty sure that this is the least number of birds/species I’ve seen there since I took up birding. 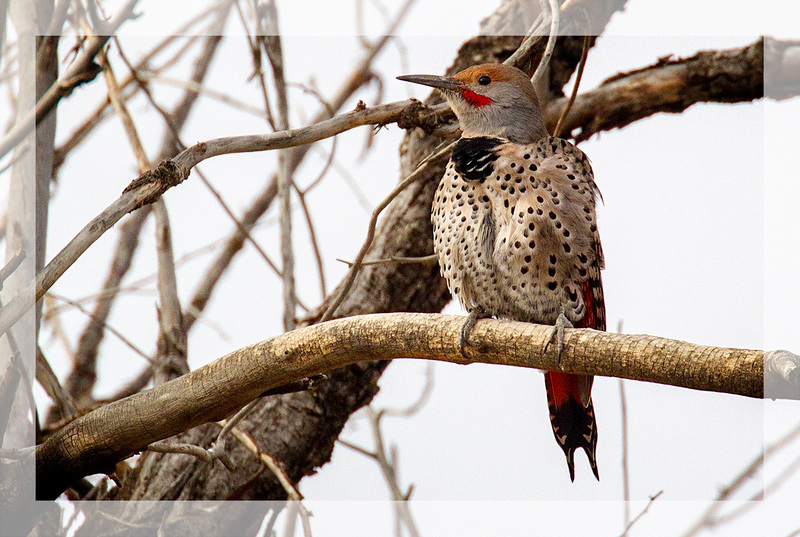 The highlight of the first day birding was the sighting of several Red-Shafted/Yellow-Shafted Flickers. This one was waiting on a post as I started my morning birding trip. 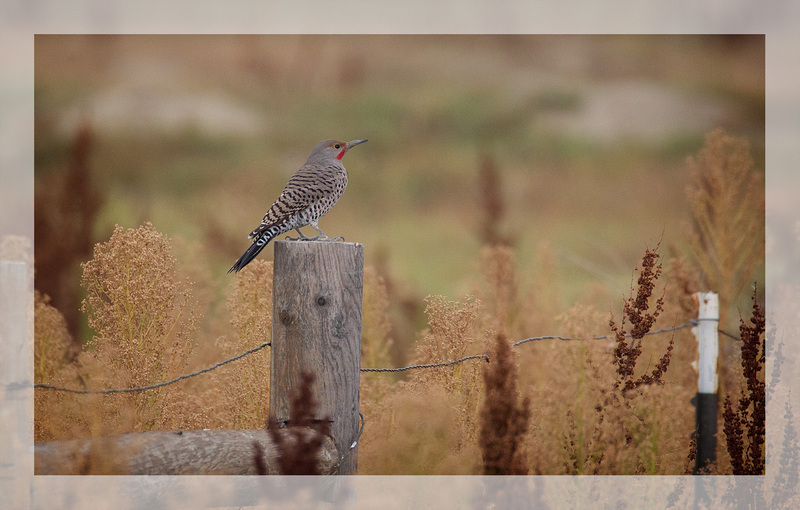 Since this doesn’t look like the kind of Flickers I see banging away on my tin chimney early in the morning, I’m assuming it was either a male Yellow Shafted Flicker or a hybrid. I’d need a lot more personal observations to make a positive identification. The highlight of the morning walk was this “totem pole” of Flickers. I assumed it must be family, though I’m not sure young Flickers look like this, but the Flickers in my neighborhood are way too territorial to flock together like this. Of course, you don’t find nearly as many anthills in Tacoma as I saw in my short walk along this creek. but when I came back the next day when there was better light, there wasn’t a Flicker in sight. Almost as surprising as the large number of Flickers was the scarcity of Magpies. In the same area where I’d previously seen several families of Magpies, I found a single Magpie in a distant tree. It was a rather slow morning, but after a hectic weekend of soccer games it provided a nice break and some much-needed exercise. So sorry that you’ve been sick. Hope that pneumonia moves on as soon as possible. The flicker photos are lovely. I also especially like the flicker totem pole. Really very cool. 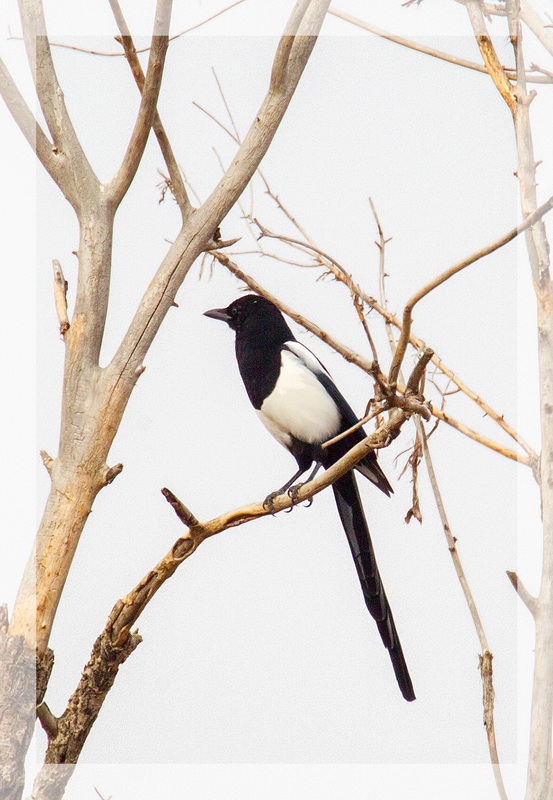 I was so surprised to see the magpie pic until I realized that I’m so used to only seeing the yellow-billed magpies when we stop at a rest-stop on Highway 101 in San Luis Obispo County. That’s the only time we see magpies. Hope you feel better soon. Take care there. I’m going to get well before you know it. Just slowing me down a bit. I’ve been working on getting in better shape for a couple years now; so I’m pretty sure I’ll recover quickly despite my 73 years. Feels odd to be hiking up the Rockies in Colorado one weekend and having trouble walking up and down the stairs two weeks later. 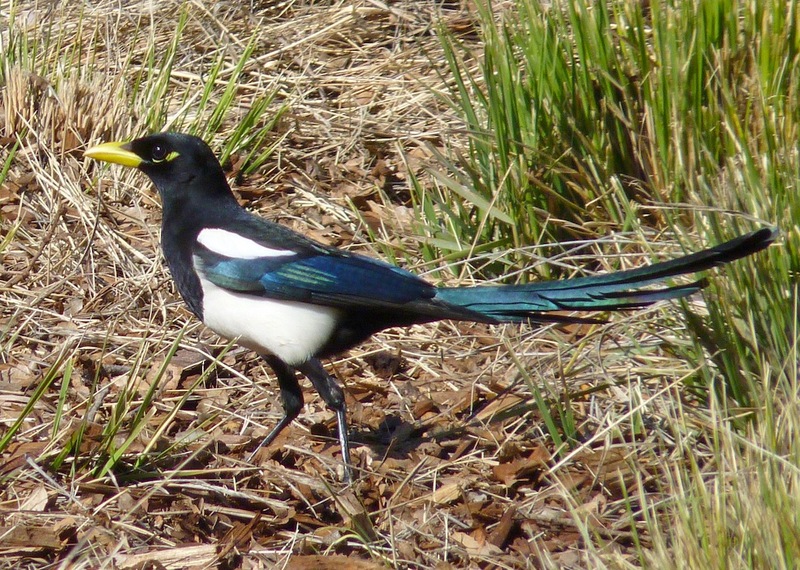 I’m not sure I’ve EVER seen a yellow-billed Magpie. Here’s a photo of one from 2013. They like to hang out at the rest stop begging for food. They have a very small range in California. Wow, that is quite different. I’d love to see one of those.